Whenever a person has travel plans on his list, there are always hassles at an airport. Airports always try their best to reduce a few steps for their customers, however, it becomes almost next to impossible to do so in today’s world of traveling. One of the ways to reduce the hassle for travelers at the airport is to install on premise information kiosks. 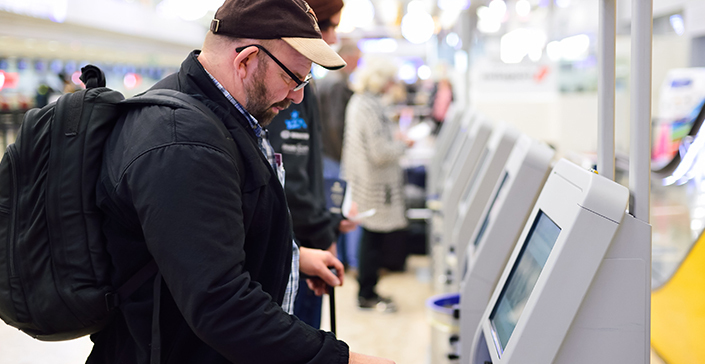 These kiosks can be extremely helpful for every traveler since they can help them ditch long lines and print their boarding passes directly for use. Printing boarding passes are not the only reason to install kiosks for travelers. Kiosks are self-service machines that can easily be handled by anyone and everyone providing travelers many options. For example, if travelers are at the airport, they can check-in well within time without even waiting in line. According to, Hospitality Kiosks Make Everyone Happy, Self-service check-in and check-out, payments and other services made possible by hospitality kiosks will save time for these travelers who place a premium on speed and simplicity. The efficiencies created by kiosks will be greatly appreciated by these travelers that want a streamlined travel experience. Self-service kiosks, when combined with software like video chat, can give out commendable results for travelers. They can simply utilize the self-service kiosk along with the video chat application in order to clear out any questions related to their flight schedules and other information as well. Travelers will not be required to run around and ask different agents different questions. They can simply stand at one place and get all of their questions answered instantly by the agents in real-time. According to, In-Store Interactive Kiosks with Video Chat & Content Sharing, The growing trend among kiosks now is to offer more choices and options to customers—thus providing greater opportunity to the customer service function to deliver truly personalized service experience. As the demands of “tech savvy” travelers increase, it is essential for all airports to cater to them as quickly as possible. These on premise kiosks also let travelers convert their currency to the currency of their destination, hassle free. Kiosks at airports not only help travelers with their questions but also end a lot of problems for the airports. They not only reduce the worries of airport officials by reducing their stress of answering and catering to the travelers constantly but they also reduce the cost of expenditure for them. Since kiosks take care of most of the customer-related queries, more officials need not be appointed by the airport authorities.